Patchmix is a graphical interface, developed in X and C++ language, designed to facilitate the construction of virtual instruments, compatible with the Cmix, software of the Music N family developed by Paul Lansky. Brief history – Patchmix was developed by Mara Helmuth at Computer Music Center of Columbia University in New York, in the early nineties. For its realization has been used mainly X, an object-oriented programming language similar to C. The goal of PatchMix is to facilitate the use of Cmix, developed by Paul Lansky, simplifying the construction of new synthesis algorithms, allowing the development of new Units Generator even those not particularly familiar with C programming. All this has made Patchmix a very useful tool in education as well as the composition of computer music. In developing PatchMix the intention was also to propose, in digital domain, a modular approach adopted with analog instruments. Operation – Feature of this program is a graphical representation of UG in form of flowcharts. Once completed the flowchart, this could be converted into a code executable through Cmix. 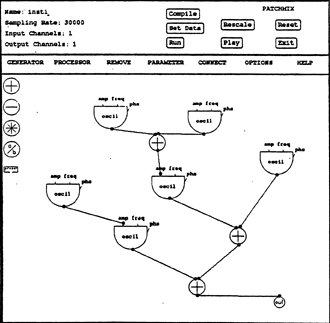 Mara Helmuth, Patchmix: a C++ X Graphical Interface to Cmix, Proceedings of International Computer Music Conference, 1990, Glasgow. Mara Helmuth, Patchmix and StochGran: Two Graphical Interfaces, Proceedings of International Computer Music Conference, Montreal. 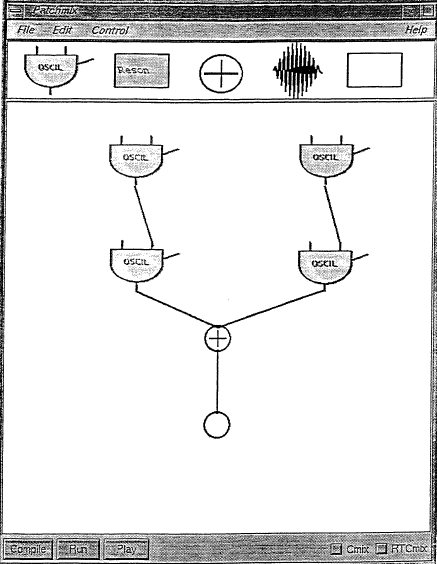 Mara Helmuth, Patchmix: a Cmix Instrument-Builder, Proceedings of International Computer Music Conference, 1999, Pechino.